We are documenting and responding to art events, exhibitions, and contemporary issues that speak to our geography, interests, and practices. On September 24th, Midwestern Press opened its doors to the public for the first time with their original location. Since then, Midwestern Press has announced they will be relocating to Over-the-Rhine, opening November 1st, 2018. Cincinnati’s latest addition to the arts scene is a publication press with a goal to disseminate information in the form of poetry, artist books, and beyond. Co-founders Blake Lipper, Thomas Wagster and Ryan Khosla, found a love of writing during their time together at the Art Academy of Cincinnati. FieldTrip met up with two thirds of the press, (Lipper and Khosla,) to discuss their new endeavor. Photo courtesy of Senja Toivonen. “We consider ourselves first and foremost conceptual artists,” says Lipper. But in the process of working towards minors in Creative Writing at the AAC, all three also felt a strong draw to poetry. While in school and afterwards, they participated in events around town, and began holding readings in their own backyard. As these events grew, they realized there was power in the way they shared their own work and the works of others. Lipper and Khosla explain that for a while they had been previously self-publishing in DIY ways; but wanted to grow their practice and publish the work of others. Thus, Midwestern Press came to life. What the team will produce doesn’t just stop at books. If a submission included a worthwhile short film, Midwestern Press would facilitate the means to create it and plan a corresponding event, or other way to get the work in stores. “That’s publishing for us. It’s not just writing. Publishing is putting things into the world and building around it,” says Khosla. For the time being, printing is done off-site through an outsourced digital printer. The writers project that within 6-8 months they will have gathered enough of their own materials to begin printing themselves. Lipper and Khosla stress the importance of being a small press, and producing primarily low runs of work. When a piece has a low production run, printmakers are more able to work hands on. The care of a handmade work, in addition to the quantitative aspects of a small press, allows for higher quality work to be made, and keeps the piece exclusive. In our interview, co-owner Lipper expressed that the special qualities of a book can be diluted by a run of even 2,000 copies. If a small press produces an artist’s book in low quantities, a sense of urgency and exclusivity is created around the work. The ephemerality of low quantities, in Lipper’s mind, means that if you want to get your hands on a book, you have to do so now, because it may never be created again. The Midwestern Pressers also believe that quality printing generates smart content within the work. They feel small, local production and distribution, “makes the act of writing more focused,” and helps push artists in their evolution of making work. For instance, if an artist writes a book and publishes it in a small run, they might be more compelled to move on to their next project, thus continuing their practice. STATELESSNESS by Thomas Wagster, photo courtesy of Midwestern Press. Low runs, handmade quality, and exclusivity are all integral pieces of Midwestern Press’ hallmark: locality. Khosla, and the others, believe “there’s a lot of amazing work being made here.” And much of it, by young artists. The three hope to encourage the growth of Cincinnati artists, and that artists feel more inclined to grow in Cincinnati, instead of feeling they need to leave the area. As mass production dilutes works of art, particularly in uniqueness, Midwestern Press also believes a loss of localization does likewise. In time spent away from Cincinnati, the group came to realize that other places, such as New York or Los Angeles, seemed to have all the resources an artist could need. They noticed that big cities had large amounts of cultural revenue, with scholars, philosophers, and critics living and working in proximity. But with oversaturation comes a loss of intimacy in events, spaces, and works of art. “I’m not against people going to New York,” says Khosla. But he wants people to bring information they have gathered elsewhere back to Cincinnati. The founders felt that Cincinnati didn’t have enough spaces bringing cultural facilitators into the city, and hope to change that through scheduling events and programs at their new location. The owners stress a shared desire to put on events, whether it be readings, screenings, or performances, and bring people to the space. “I think that’s what important for us with the bookstore too,” says Khosla, referring to the face-to-face interaction that events tend to foster. The bookstore at Midwestern Press features a collection of almost-rare books gathered from other publishers, (many of which are for sale in the space for Cincinnati locals,) and is almost like an exhibition in itself. The books are art objects and spatially, they create relationships with one another. This carefully curated collection is in direct relation to the work the publishers are currently putting out into the world. “It elevates, or puts on a certain plane of discussion, the work we produce,” explains Khosla. In their new Over-the-Rhine location, Midwestern Press is down for pretty much anything. When choosing submissions, they select based on the quality of work, and how the work is “engaging with and empathetically investing the outside world,” says Lipper. They seem truly open to all topics, even touchy subject matter, as long as the work isn’t offensive or malicious. The owners have strict beliefs on the bookstore being artistically-driven, instead of for-profit. This philosophy reflects their attitudes towards the entire creative endeavor. Lipper and Khosla explain that Midwestern Press has been funded completely out of pocket. “We’re very weird about money because we don’t want to get money mixed up with our doctrine,” explains Lipper. “Not to say that grants are bad by any means, we just don’t want to adhere to anyone else’s standards.” Outside financial influences then, can quickly make artists and publishers lose creative control over their own projects. Khosla elaborates, saying that from experience and observing those around them, “we’ve learned we need to do this ourselves.” In an almost surprised manner, Lipper laughs as he describes the press as “oddly self-sustaining” financially, and says they hope it can remain autonomous. Midwestern Press recently announced that they will be moving to Main St. in Over-the-Rhine. “We think it’d be beneficial for everybody if we were a little closer to everything else that is happening,” says Lipper. The move is intended make Midwestern Press more available to anyone interested in what they have to offer. “We’re looking at how we can continue to grow and be more accessible. I think that’s really important to us: how we are accessible to the community around us and how we can cater to them,” furthers Khosla. Midwestern Press, which promises to diligently review each work, will be taking submissions through December via their website. Doors will open Nov. 1 at 1411 Main St. in Over-the-Rhine. Originally from Cleveland, Senja Toivonen is a second-year Fine Arts student at the University of Cincinnati. Additionally, she is minoring in Art History and pursuing certificates in Critical Visions as well as Journalism. Senja is passionate about writing and all things contemporary art. Currently in her own practices, she is exploring concepts revolving around text and narrative, contemporary art trends, and internet culture. I’ll Be Your Mirror, Visionaries and Voices Northside, runs January 10, 2019-March 20, 2019. Truth or Dare: A Reality Show runs at Cincinnati’s 21C museum hotel from September 2018-July 2019. 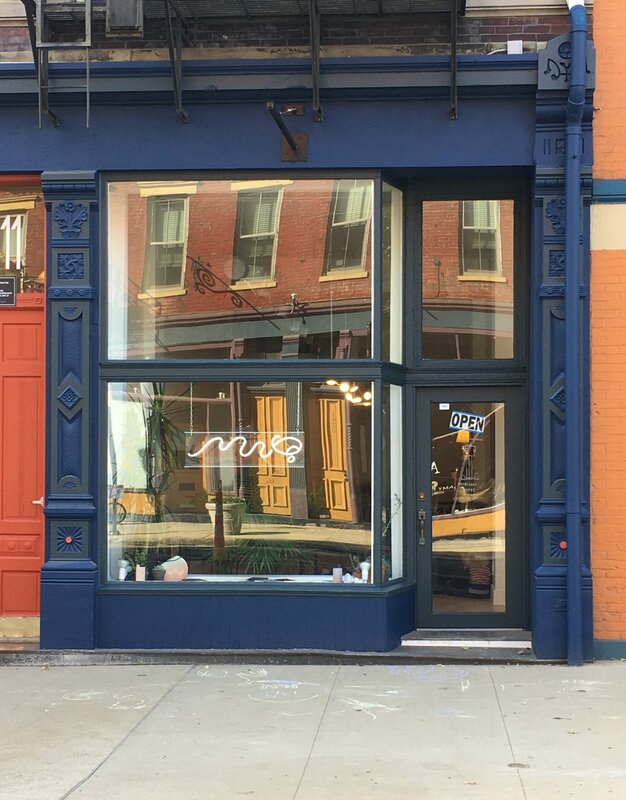 Midwestern Press has announced they will be relocating to Over-the-Rhine, opening November 1st, 2018. FieldTrip met up with two thirds of the press, (Blake Lipper and Ryan Khosla,) to discuss their new endeavor. There’s more than meets the eye here—as a matter of fact, there’s Sights & Sounds: a one-night art exhibition paired with live music, curated by Nick Mason. Work/Surface opens June 22nd at the Weston Art Gallery and runs through August 26th. The Weston hosts a gallery talk with both artists June 28th at 7pm. The Mini Microcinema screened La Ciénaga, a film directed by Argentinian Lucrecia Martel, on March 1st, 2018. Malcom Cochran’s exhibition Requiem was on view at the Weston Art Gallery on 650 Walnut Street, Cincinnati Ohio, from February 9th, 2018 through April 8th, 2018. Sheida Soleimani's Performance of Medium of Exchange took place at the Cincinnati Contemporary Arts Center on March 29 and 30th from 7:30 PM - 8:30 PM.